Bold wedding fashion statements that never goes out of style! How often it happens, you look at an image in a fashion magazine and get inspired to learn and explore art and style in any form! Almost three decades ago, a glimpse of actress and fashion icon Elizabeth Taylor and her daughter Maria Fisher Burton photographed together made me realize that her innate sense of style was beyond words and admiration. I remember going to the library later that day and turning pages over pages of all the foreign magazines to find more about her unique sense of style. The style and colors were bold for that golden era but made a mark on many viewers like me who were in their teens and living thousands of miles away. Elizabeth Tayor in my eyes, was a bold and beautiful actress with unbeatable fashion icon looks. I am sharing a few of her wedding pictures that inspired me. 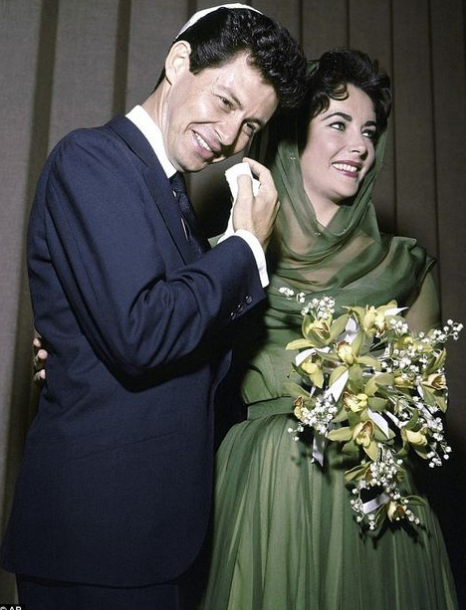 What a bold statement she made by wearing a classic dress with the irresistible bridal bouquet for her wedding to singer Eddie Fisher in May of 1959 in Vegas. In the second image, Elizabeth Taylor made a bold statement with the delicate floral headband or you may call it floral crown in 1964. Last two images from her last wedding standing next to her friend Michael Jackson. Wouldn’t you like your wedding day to reflect your personal style and making a statement of your own!